Tabbouleh is, of course, neither English nor Southern, so how did it become part of my repertoire? My sister-in-law (Mr. Delightful's sister) married into a Middle Eastern family and learned to make all sorts of wonderful dishes, including tabbouleh. One time, many years ago, when we were spending a week or so with her, we attended a big family gathering (a bridal shower, I think) where her nieces showed me how to make it. Only when I went home and made a small batch of it did I fully appreciate all the work that had gone into the huge batch they had made for the shower. All by hand. So that's how I've always done it. The food processor might make quick work of all that parsley and mint, but I've yet to try it. Now, after all this time, I'm afraid to. Afraid I'll find out it works great, and then I'll be kicking myself! It's perfect for summer, especially cookouts. It’s easy to keep serving up the same favorite barbecue menu all summer. Instead, try a different theme once in a while. A Middle Eastern theme might include grilled butterflied leg of lamb, grilled eggplant and other vegetables, along with dishes such as hummus, baba ghanoush and tabbouleh. 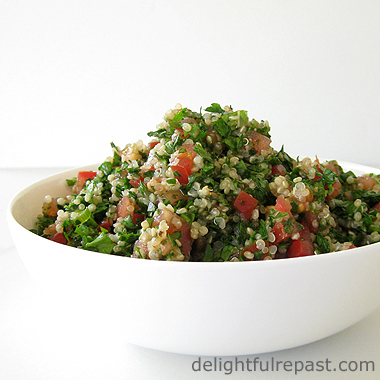 This recipe calls for a great deal more tomato, parsley and mint than many tabbouleh recipes. I am told by Middle Easterners that the recipes that are more bulgur than salad or that call for garlic or green peppers are not authentic. But who’s to say what is authentic? Every family of cooks has its own variations on traditional dishes. And here I am really flouting authenticity, using organic quinoa instead of bulgur. If your family has a tabbouleh tradition, I'd love to hear about your recipe and whether you chop by hand or use a food processor. 1 In small saucepan, bring water to a boil. Stir in quinoa and salt. Return to the boil, cover, reduce heat to lowest possible, and simmer for 12 minutes. Let stand, covered, for 5 minutes. Transfer to 2.5-quart bowl. 2 Meanwhile, prepare by hand the tomatoes, green onions, parsley and mint. Spread the diced tomatoes and their juice over the quinoa, then add the sliced onions and chopped parsley and mint. 3 Whisk together lemon juice, olive oil (start with 1/3 cup), salt and pepper. Pour over tabbouleh and toss to mix well. Taste and adjust seasoning; add more olive oil and/or lemon juice, if needed. Cover and chill for 1 hour (or up to 1 day). Serve with grape leaves or leaves of lettuce or cabbage for scooping. Note: You can change it up a bit with the addition of either cucumber or red bell pepper, cut into 1/4-inch dice. My husband (Mr. Delightful) must really be getting into this whole food blogging thing. I told him we were having chicken soup for dinner. When he dug into it he said "This is great! You're going to blog it, right? What are you going to call it, chicken chowder?" This from a man who reads only my food blog, no food magazines or cookbooks, no food shows. What could I say but "Never heard of it. Sounds good to me." He does not like dark meat chicken, so I used chicken breast; but you could use thighs just as well. I usually make a clear, brothy chicken soup; but for some reason I went thick. The word "chowder" didn't even occur to me because I hate clam chowder and don't ever make it, even for other people. 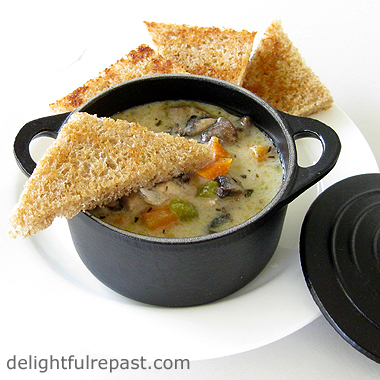 All you need is some great bread to make a meal of this soup; choose one from the Delightful Repast Recipes index page. What is your favorite soup? Do you eat soup all year round as I do, or is it something you reserve for the cold months? 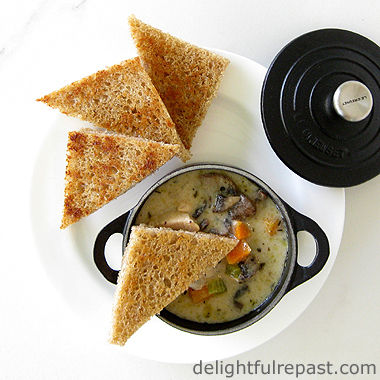 Couldn't resist serving it in my cute little Le Creuset cast iron mini cocottes! 1 In large pot (I use a 5.5-quart Dutch/French oven), heat oil and stir-fry chicken pieces until lightly browned, salting and peppering* lightly, about 5 minutes. Remove to a bowl. * I measure out the salt and pepper into two tiny prep bowls and use them throughout the recipe. 2 Add butter to pot and cook mushrooms, salting and peppering lightly, about 5 minutes. Add to chicken in bowl. 3 Add onion, carrot and celery and a bit of the salt and pepper to the pot and cook until softened, about 5 to 10 minutes. Add thyme and marjoram. Stir in flour, adding a bit more butter or oil if needed to incorporate the flour, cooking for 2 minutes. 4 Stir in sherry, milk and cream. Cook for a few minutes. Stir in chicken broth and bay leaf. Bring to a boil; lower heat and simmer for 10 minutes. Add chicken and mushrooms, and continue simmering for about 20 minutes. Taste and adjust seasoning. 5 Ladle soup into six bowls. Garnish each with about a teaspoon of chopped parsley. 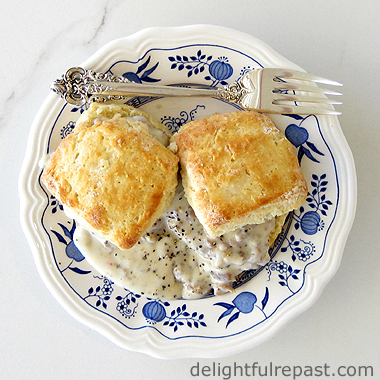 Biscuits and Gravy, with or without a side of eggs (I like mine scrambled), makes a classic Southern breakfast or breakfast-for-dinner. If you fear sausage gravy is just a heart attack waiting to happen or think you don't like it because it's too greasy, I'm here to tell you it doesn't have to be. Contrary to popular belief, it only takes about 2 tablespoons of fat to make a generous quantity of sausage gravy. So you can relax and have it more often. Perfect for a weekend breakfast, it comes together quickly enough to be a great weeknight dinner as well. I like to make the biscuits, start the gravy, then pop the biscuits in the oven. While the gravy's bubbling away, cook some eggs. If you've frozen a batch of my unbaked Homemade Freezer Biscuits, breakfast or dinner is really a snap! 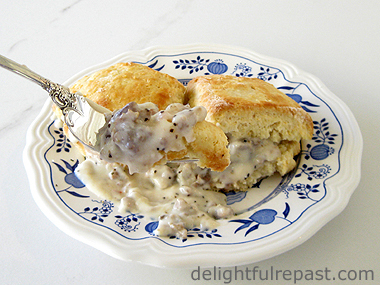 Whenever I do a Southern classic (like Cream Gravy), I like to point out that I'm "half Southern on my Daddy's side," but even my not-even-half-Southern husband loves it, too! Do you like breakfast-for-dinner? 1 Preheat oven to 500F/260C/Gas10. Lightly spray an insulated baking sheet with cooking spray. In 1-cup glass measure, stir together vinegar and milk; let stand for a few minutes while proceeding with recipe. Whisk together the dry ingredients in a large bowl. With your fingers or a pastry blender or two knives, cut in the cold butter until the mixture looks like coarse crumbs with some bigger chunks remaining. Pour soured milk (or buttermilk) over flour mixture and gently mix until just combined. If more liquid is needed, just add plain milk a little at a time. Note: If you're using a regular, non-insulated baking sheet, you should probably use a lower oven temperature, 425F/220C/Gas7, and increase the baking time to 12 to 15 minutes. 2 On a lightly floured surface, gently pat the dough into about a 3/4-inch-thick 6x8-inch rectangle. Cut into 12 square biscuits, and then gently round each biscuit by hand or leave square. (If you use a round biscuit cutter, you either waste dough or have some tough biscuits made from re-rolled dough.) Place about 2 inches apart on the insulated baking sheet and bake for about 10 minutes or until golden brown. When I remember to do it, I brush the tops of the biscuits with a little milk before baking. It makes them pretty! 3 In skillet over medium heat, cook sausage, breaking it up into crumbly little bits. I like to cook it until browned. Drain off all but about 2 tablespoons* of fat. Sprinkle the flour over the sausage and cook, stirring, until the flour is absorbed and has had about 1 or 2 minutes of cooking. * If you're not sure what that looks like, just drain off all the fat and measure 2 tablespoons back into the pan. 4 Whisk in the milk (and broth, if using). Turn heat to low and continue stirring until mixture is thickened and bubbly, about 5 to 10 minutes. 5 Stir in salt and pepper. If you like thicker gravy, cook a little longer. If you like thinner gravy, add milk or broth a tablespoon at a time until it's just the way you like it. Taste and adjust seasoning. 6 Split the biscuits and place on six plates. Divide the gravy among the 12 biscuit bottoms; top with the biscuit tops. 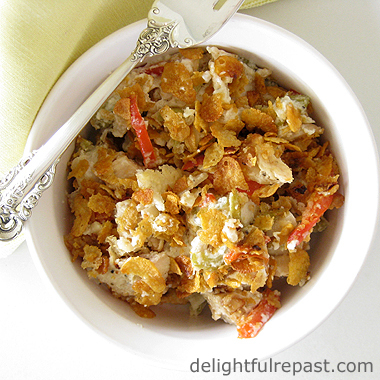 Warm Chicken Salad or some such thing might be a better name for this dish, but my husband called it Chicken and Corn Flakes the very first time I made it when we were newlyweds, and the name stuck. Even back then I was all about organic and local, and yet I made an exception for canned water chestnuts. Since then I've gotten even stricter about all my food being organic and local, so the imported canned water chestnuts had to go. Instead, I use daikon radish. Jicama would also work, if I could ever get my hands on a domestic one. And Jerusalem artichokes are a possibility, but I haven't actually tried it in this dish yet. I like to make it with both green and red bell peppers, but today the organic green bells were imported so this batch just has the red ones. And, as you might imagine, I do battle with myself over eating almonds in view of issues around the water crisis where they are grown. But some days I give myself permission to just take a breath and take a bite! We first had this, or at least what this started out as, at a dinner party. 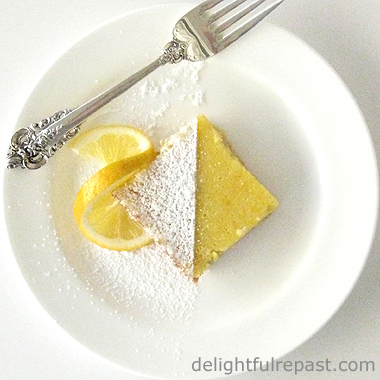 The hostess would not divulge the recipe, but I easily worked it out for myself. How do you feel about sharing your recipes? There are one or two good reasons someone might not share, but I'm not going to name them. I'll just see if one of you will! Two Shepherds Grenache Blanc 2013 was the perfect wine for this dish. Though enjoyable on its own, it pairs well with a variety of foods. It would have been perfect for my recent and brief seafood kick or with anything that calls for a white wine. 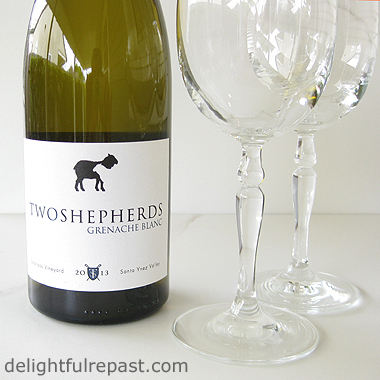 Very popular, Grenache Blanc has become Two Shepherds' flagship single varietal wine. This beautifully crafted unfiltered white is what I call a spirited wine, with an almost spritzy (no actual effervescence) zippiness. Pale straw in color, it does not "pale" on the palate. I'm not a wine expert and don't pretend to have an extensive vocabulary of wine descriptors, but I'd say this wine strikes a balance between softness and crispness. 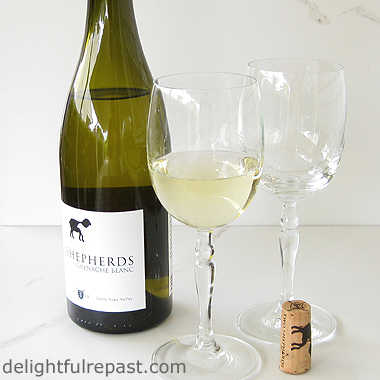 It has just the right level of acidity to make it bright and refreshing. I tried it both in and out of the recommended temperature range (52 to 56F/11 to 13C) and liked it at any temperature. Had it with a cheese plate, too, and marveled at how it changed with the cheeses. Bet it would have been great with my Gougeres! Have you discovered any delicious food and wine pairings lately? Note: See Disclosure at end of post. 1 Preheat oven to 375F/190C/Gas5. Sprinkle boneless skinless chicken breasts all over with a little of the 1 teaspoon salt. Bake for 30 minutes. Chill thoroughly. Cut cold chicken into bite-size chunks. Place in 3-quart bowl. Add celery, daikon, bell peppers, onion and toasted almonds to bowl. 2 In 1-quart saucepan, make a quick bechamel (with milk) or veloute (with broth) sauce. Melt the butter, stir in the flour, cook for 2 minutes, and remove from the heat. Gradually whisk in the milk or chicken broth. Return to the heat and simmer, whisking or stirring, until thickened. Stir in the Parmesan and season to taste, using a bit of the 1 teaspoon salt. Add to bowl and stir sauce into the chicken and vegetables; stir in the mayonnaise and lemon juice. Taste and adjust seasoning. 3 Grease or cooking-spray a 13x9x2-inch baking dish and pile mixture lightly into dish. If not baking until later, cover and refrigerate until 45 minutes before serving time. 4 One hour before serving time, preheat oven to 350F/180C/Gas4 for 15 minutes. Uncover and bake casserole for 30 minutes. Turn up heat to 425F/220C/Gas7, top casserole with cornflakes and bake for 15 minutes. Disclosure: From time to time I'm sent a bottle of wine free of charge for sample purposes. If I like it, I might tweet about it and might even write a blog post about it. If I don't like it, well ... I just don't mention it. This wine was given to me; I received no other compensation. The views expressed here are entirely my own. I always tell my readers what I really think!